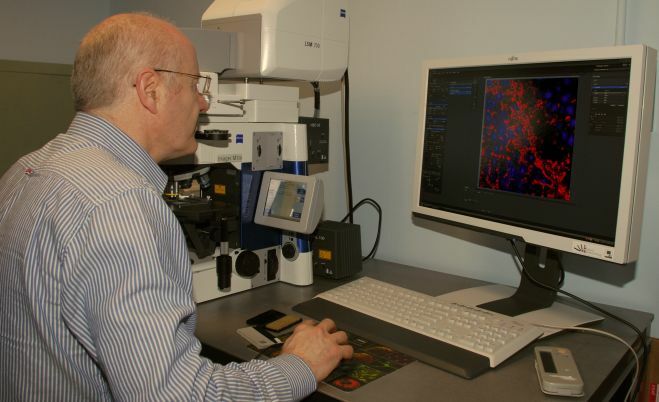 This is a basic workhorse confocal system offering high sensitivity and limited spectral imaging capabilities. Although the unique variable beam splitter limits this system to two fluorescent channels, smart setup and "Auto" exposure functions permit the user to create and optimise configurations for sequential scanning of four or more fluorochromes, with DIC as a further option on the x 20, 40 and 63 objectives. Fully spectral system capable of x, y, z, l scans. Upright laser scanning microscope with two PMT's for fluorescence imaging and one for DIC/phase contrast. Objectives/NA: Air (x10/0.3, x20/0.8) Oil (x40/1.3, x63/1.4). Scans in 8, 12 or 16 bit modes at pixel resolutions up to 2048 x 2048. Transmission detector for phase contrast (x10-x63) or DIC (x20 upwards) imaging. Four diode laser lines: 405nm, 488nm, 561nm and 639nm. Capability to image two fluorochromes simultaneously or four or more sequentially using stored or user defined collection windows. Electronic zoom ranges from 0.5-30x objective power.